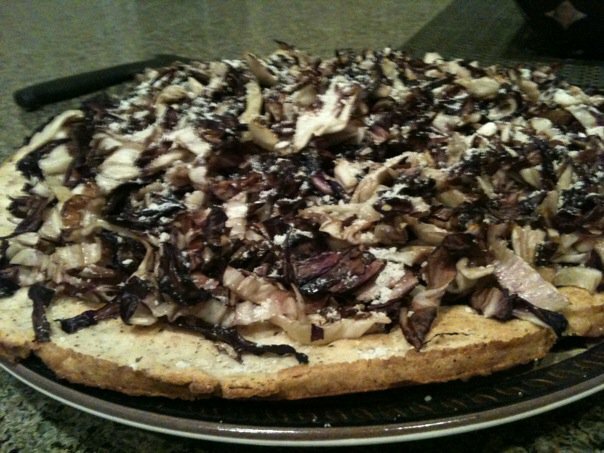 a pre-packaged pizza crust, not frozen (I buy a multi-grain crust at Whole Foods); one large head of radicchio, or two smaller ones if they’re the size of grapefruits; extra virgin olive oil; white truffle oil. I bake the crust according to the directions on the package, getting it to just the point where it starts to turn a light golden. While it’s baking, slice up the radicchio into ribbons, toss with a couple of tablespoons of olive oil and a couple of teaspoons of the truffle oil (it’s strong, so be careful not to overdo it), salt and pepper. 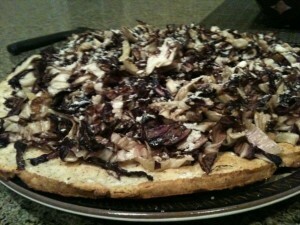 After 7-10 minutes, pull the crust out of the oven and pile it up with the radicchio. Put back in the oven for 1-2 minutes, just long enough for the radicchio to wilt. And — voila! — instant, scrumptious pizza! I like a little Grated Vegan Topping “parmesean” on top, for a nice finishing touch. I use scissors to divide up the pie, because the ribbons of radicchio make using a pizza-cutter a little tricky (and messy!). Our pups Otis and Galileo always are there right by my side to make sure they get their fair share, too! That little bit of white truffle oil really makes all the difference: this simple pizza is a great example of how “short on time” doesn’t necessarily mean short on flavor. As a variation on this recipe, try sprinkling the pizza crust with some arugula or baby spinach leaves before adding the radicchio. sounds interesting. we’ll have to try it. i like to make a salad with greens, radicchio, green pepper, cukes and a small sprinkle of crispy onions and a homemade honey mustard vinaigrette (honey, hot and sweet mustard, olive oil and seasoned rice vinegar).